It is easy to talk about these. All you need to know is that they rare and valuable. Very few banks in the 1860s and 1870s had the need for such a high denomination. Furthermore, very few people in that same time period had a net worth of $50, much less the ability to ever own a $50 bill for more than a few hours. 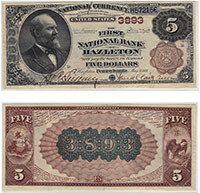 Only about 40 notes like this are known to exist today (and that is across all banks in the country). Values start at $10,000 and go up from there. Contact us if you need an exact price. Don't forget to check the serial number. Number 1 notes always sell for nice premiums.